Yet another product I have tried and wanted to let you know something about. 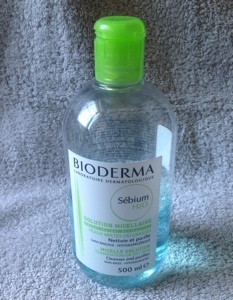 This time it’s about the Bioderma Sébium H2O solution micellaire. It’s a miracle in a bottle. It is a clear make-up remover that looks like water but it has more to it. And if even gets easily rid of your waterproof make-up. You can put it on a cotton pad and clean the face. It can be used as a make-up remover, but even when you don’t have any make-up on, you can still use it as a regular cleanser. It cleanses and purifies the skin. There are different varieties in this product. I have the Sébium one, because that one is more for a combination to oily skin. And than there is the Créaline and Sensibio, which are more for normal to sensitive skin. They sell 3 different sizes, one of 500ml which is the biggest, one of 250ml and one of 100ml which is a small bottle. Mine is 500ml and you get a long way with it. If you use make-up on a regularly basis, you can use it about 3-4 months. It is a bit more pricy than some other similar products, but I think it’s worth it’s price. And sometimes there are specials with two bottles in for a good price. I do have to say that it’s a bit hard to come by in the US, but there are sites who sell and ship to the US. Of course you pay a bit more because there are shipment costs. I would certainly recommend it! Which make-up remover do you use? This entry was posted in beauty and tagged bioderma, Product review, solution micellaire by missnathaliexo. Bookmark the permalink.